Please Help Before I Take A Hammer To My New Rig! Thread: Please Help Before I Take A Hammer To My New Rig! The only things not out-of-the-box brand new are the 3d Rocket pro, the DVD combo and the case. When I put it together for the very first time, it powered on straight away, detected all the drivers and let me into the bios without any problems at all, which I took to be a good sign. Due to an application on the mobo's driver CD used to make the SATA driver floppy that wasn't working, it took a little while to get windows XP pro installed, but after a few days it was installed, fully windows updated and running nicely. However, it's not even a week old and already I'm getting this really frustrating problem. Sometimes when I switch the PC on, it begins to boot but then hangs on the memory test part and the screen just displays 'Memory T'. It will then stay on this indefinately. The first time it happened, I fixed it by taking out one of the sticks of ram and booting up with just one, then shutting down and putting the second stick in. The second time it happened, I had to remove both sticks, try to boot (obviously it failed completely to do anything and shut down almost straight away), then replace both sticks and it then booted perfectly. What gives? I don't want to have to take my case out and mess about with the ram for ten minutes every time I want to switch it on. I have never come across this problem before on any other machine and clearly all of the hardware it compatible and works fine or it wouldn't work at all. Has anyone ever seen this before? The new system looks ok right, no glaring problems or anything? Could it be the really cheap unbranded power supply that is the problem? Or could it be that I need to up the voltage to the ram in the bios? Some advice or assistance would sure be appreciated! 1. Whats the RAM voltage? 2. Whats the BIOS revision? 3. Is it the latest BIOS? Increasing the ram voltage is worth a try.........what voltage is the ram specced for? As Steve said, give Memtest a try. yeh never let ram set itself up, any high end sticks normally need set voltage and timings to work right. 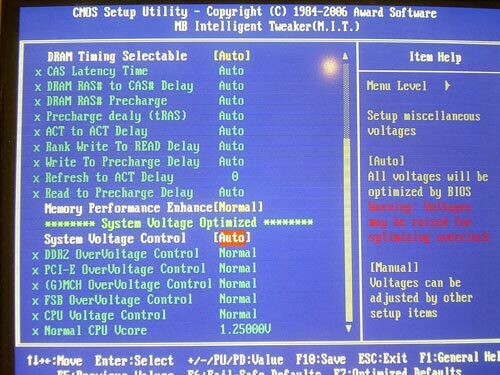 @Steve B: I don't know what the voltage for the ram is by default (i haven't adjusted it), the bios just says 'AUTO' for it. The bios revision is F5. F11 is the most recent. I just tried to update the bios using @bios but the computer froze. Total pant-fill moment, but luckily it froze during the backup of the rom, not the flash. I guess I need to update the bios, then maybe someone could asisst with setting the timings, but should I wait for my new psu to arrive first and just battle with the machine until then? So it seems that the ram is not compatible with the mobo as the ram should be 4-4-4 2.0v but the mobo requires 5-5-5 1.8v. Is this correct? can i just set the ram the way the mobo wants it or is that what has been done automatcially and that is causing the problem? yeah, I have a bios screen just like that. The overvoltage section for the ram allows me to up the voltage by a certain amount, but I don't know what it is currently set to in order to work out how much to up the voltage... is there an app that can check this for me? Do I just assume that it is set to 1.8 by mobo and therefore increase it by 0.2v? Seriously, if you value your components, dont use that PSU. If that is indeed the cause of your problems and it does decide to blow, it could potentially take the rest of your stuff with it. Not worth it. Wait till your Antec arrives. As it says above you should be able to change the voltage control to manual and set it to 2.0v. You can do the same for the timings as well. I set my RAM to 2.1 as advised also.